Can new roads pay for themselves? It’s common to hear people say that because roads are paid for by their users (fn 1), we should build more roads. After all, the new roads will fund themselves! At first glance, this seems convincing. But a closer look reveals that the “new roads pay for themselves” argument is based on a logical fallacy. Basically, the fact that the average road pays for itself does not mean that the next road will also pay for itself. In fact, there’s a large amount of recent evidence from the transport market that the next, or “marginal”, road will cost taxpayers more than it brings in revenue. Economists understand the importance of marginal analysis when making decisions about what to build and how to charge for it. Businesses typically make pricing and production decisions “on the margin”. In other words, they look around for the next potential customer and ask: “Can I produce one additional unit and sell it to that person for a profit?” If the answer is yes, they produce it; if it’s no, they don’t as it would reduce their overall profits. So what is the market telling us about demand for new roads? As always, it’s best to go and look at the empirical evidence. Over the last decade or two, there have been a number of efforts to get users to pay for new roads. Australia, the US, New Zealand, and a variety of other places have built toll roads – sometimes privately financed, sometimes publicly financed. In most cases, revenues from users were expected to pay the cost of the roads. These costly investments have almost all failed. Toll roads have suffered from low traffic and low toll revenue. They have often required expensive taxpayer-funded bailouts. It looks as though people are not willing to pay for the marginal road. The failures include the A$1bn Sydney Cross City Tunnel, which has seen traffic volumes less than half of forecasts, and the Brisbane Clem 7 and Airport Link tunnels, where traffic volumes have fallen short of forecasts by over 75%. The record for these projects is abysmal. Two of the projects declared bankruptcy. The assets of one, Pocahontas, were written down to zero by its new owner, and two were bought by the government jurisdictions where they were located. Another is in negotiations to be bought by the state of Virginia. None of these projects fulfilled their initial plans to operate successfully as profitable, private companies. Macquarie’s most substantial U.S. project, the Indiana Toll Road project, is near insolvency and attempting to restructure its loans. The New Zealand Transport Agency will take $62.5m of the remaining Route K debt from Tauranga City Council, it has today announced. The council signed off the agreement with NZTA over the ownership of the debt on Route K in a meeting today. The agency had already agreed to take ownership of the road from July 2015, but at a council meeting this afternoon, councillors discussed the agency also taking on the debt, less $1 million which the council would still owe. The removal of the debt would see the council’s credit rating upgraded from A+ to AA-. In this context, it makes more sense to invest the marginal transport dollar in providing better transport choices. After half a century of underinvestment in public transport and walking and cycling facilities, there’s a lot of latent demand. As a result, every time Auckland has built a new piece of public transport infrastructure this century, demand has outstripped projections. 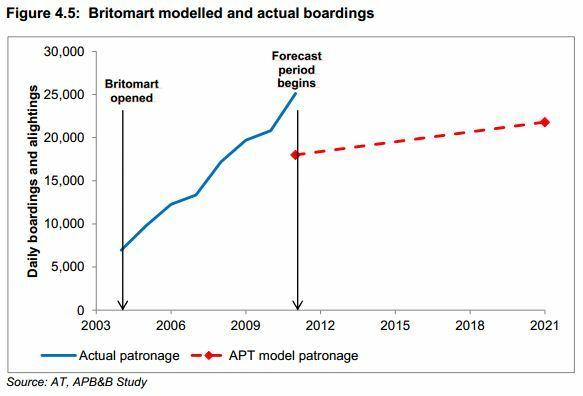 Here, for example, is a graph from a few years ago that shows that Britomart met its 2021 patronage targets more than a decade early. In other words, people aren’t willing to pay for new roads, but they are queuing up to get on the bus or train. Transport policy should recognise these market signals and invest in choice. The market has spoken. It wants some more trains. Footnote 1: This is factually incorrect. Since 2004, the National Land Transport Fund, which consists of fuel taxes, road user charges, and vehicle license fees, has paid 100% of the cost state highways. However, it only pays 50% of the cost of local roads, which account for the majority of vehicle kilometres travelled. The remaining 50% are paid for by local council rates. What sways government is simple: Road users pay for their vehicles and operating costs. Rail and bus users only partially pay for theirs. As Mr Brownlee said in parliament a few months back: When a commuter hops on a train at Papakura to go to Britomart, they only pay $10, and society whacks on a whopping $50 subsidy to make up the true cost. If that commuter used the road instead, in their own car, the figures are reversed, with the user paying the $50 in petrol, car running costs and parking. Society pays the lesser $10 for road maintenance. It comes down to ideology – right wingers will go for user pays. Lefties will go for socialism. Then society pays big time for the social welfare costs, health costs and so on due to the huge burden transport places on people. Cities with a greater focus on private vehicles results in people spending way more of their income on transport than denser cities with multi – modal transport systems. This is a real cost borne by society, not necessarily willingly. The entire point of this post was that _new_ roads now tend to fail the “user pays” test. Did you even bother to read it? And on PT cost recovery: Because rail has high fixed costs and (post electrification) relatively low operating costs, the _marginal_ cost of new users should be very low and in some cases equal to zero. In other words, once you’re running that train from Pukekohe to Britomart, each additional passenger costs very little. That’s not true on the roads. Two points Peter: Firstly, you’re referring to toll roads as failing to pay for themselves, despite projections saying otherwise. In NZ, all toll roads are required to have a free alternative. I think the lesson here is that tolling doesn’t work in NZ. Too many kiwis will take the cheap route. Tolling is also a difficult way of recovering costs, because the toll system itself is expensive to administer. Secondly, with the exception of recent borrowing for the RoNS, the state highway network does actually pay for itself from user charges, but it involves cross-subsidies. The busy roads (like SH1 Auck-Ham) pay for themselves and subsidize the loss making ones (like SH35 East Cape). Local roads however, do not pay for themselves, but then they are not required to. One thing is for certain, other modes cannot replicate the function of local roads, so there’s little choice to build them, unless we want to start developing suburbs with no road access, and therefore no ability for emergency vehicles to attend to fires and medical situations. 79% used the toll road over the free route alternatives. I’m glad you agree with my points! As you say, it’s really hard to get new roads to pay for themselves when there is an existing road already in place. I also think you’re right to highlight the degree of cross-subsidies between high-traffic and low-traffic roads. Contrast that with KiwiRail, where all routes are facing strong pressure to pay their own way. Geoff, new roads don’t pay for themselves. They are typically massively expensive (the cheap roads have been built) and are funded by all of society for the benefit of a few. It’s okay to be opposed to ‘socialism’. It’s not okay to ignore the facts. Conservatives are happy for society to pay for externalities like congestion, pollution, accidents, noise, and inequitable affect on property values. That must be why the council has been trying to spend $500m a year for road costs out of rates right? About the only toll road that hasn’t gone bad has been the the Northern Gateway one to Puhoi. However there are some notable features. For starters it saves a considerable amount of time over other routes and importantly the toll is only covering a loan for half of the construction costs, the rest of the costs were paid for from the NLTF. Had it been built to be fully paid for by tolls it would have between a failure too. Technically, that means that the Northern Gateway _also_ fails the user-pays test. I went looking for a decent citation on the funding structure for that road but couldn’t find anything with numbers on. Revenue from the NGTR is about $13m annually. Thanks for that link Cam. I note that for the 6 month period, NZTA use $2.8M to operate the toll (pg 7), leaving a payment to MoT for debt repayment of $3.6M (pg 6). So the net revenue pa for this $380M project can be estimated at just over $7M pa. This is before road maintenance costs, which I think will be rather expensive for that tunnel, but I assume are funded from the NLTP. Yes fails the user pays test. From memory the reason for the loan/tolling wasn’t to justify the project completely but to bring it forward i.e was supposedly going to happen anyway through normal funding process in about 10 years and toll allowed that to be brought forward. I would argue there is another reason the Northern Gateway looks a little better; it is the first leg of the Holiday Highway, a considerable portion of its users are more likely to value their time over their money [ie are well off]. In another location serving a different socio economic group the proportion choosing the free route is likely to be higher. For trade users of course the toll is a business expense so they are also incentivised to choose to pay it as it is not their own money, and is insignificant compared to fuel cost. Peter, is it really true that Nat Land Transport Fund, comprising reciepts from users, has met 100% of the cost of state highways (your footnote)? I thought proceeds from the selldown of power companies was also being used to build new highways (in other words, even highways are subsidised from other sources)? There are two projects funded from this source- the ‘Auckland Motorways’ package (about $800m) and the approx $200m regional package. The $800m Auckland package is a loan for which repayments are being made from the NLTF. The $200m regional roads package is coming from the asset sales fund. Correct, the user pays thing for state highways was only completely true for a few years. And even then didn’t reflect the sunk costs in the network. Also note that the *very* local roads within a subdivision are initially paid for by the developer, not the council. They are then vested in the council who takes responsibility for maintenance and so on in the future. A simple graphic might help for the people who say “road user charges pay for roads” and “cyclists should pay for roads”. There is no doubt that every km cycled subsidises a person in a car. Bicycles cause no damage to roads and can’t ride on State Highways. Cyclists can’t ride on motorways, but state highways are okay. So get the private market to pay for it, go bankrupt and buy the new asset at a big discount. Sounds like a great plan. I can’t believe they keep building them when they keep failing. All the while they ignore the growth in PT that defies projections. Crazy stuff. Geoff, I think a big point that is missed in the direct cost calculation is the indirect costs. Sure PT users might be subsidised, but it also takes cars off the roads which is a benefit to other drivers. I would also expect that the more PT users, the lower the subsidy per user. Not to mention private vehicles are also heavily subsidising all the heavy vehicles on the road by a significant margin. If trucks had to pay the full cost of the damage they do to the roads, most of freighting industry would be bankrupt and rail would much more attractive. Creating a society where everyone is forced to drive a car has put a huge financial burden on families and has help create an obesity crisis with all the healthcare issues that entails. You don’t see those costs factored into BCR calculations. the “new roads pay for themselves” argument is based on a logical fallacy. The obvious reason is because all these toll roads were predicted to pay for themselves . . . thats why the investors stumped up the hundreds of millions to have them built. I do agree there is a serious issue with toll roads that trying essentially to get people to pay for a service when it is also available for free. But there is nothing inherent in the toll road model that means that it cannot be applied to building some roads and it has been very successful in many instances across the world. The Australian toll road failures are really evidence of the reality that forecasts, especially those associated with large infrastructure projects, carry real risks one of which is optimism bias . . . an effect explored in depth by Bent Flyvbjerg (who points out PT projects have a worse record of cost overuns than roading projects). The investors have rightly reacted by suing the forecasting agencies such as Parsons Brinckerhoff and Aecom (who lead the CBD Rail Link Business Case). Sorry Peter, IMHO the Australian Toll Road experience is more of an judgement on the Dismal Science than of the case that new roads cannot fund themselves. But Tony it is not cost overruns that sunk these projects but that the traffic didn’t turn up. There is little to no driving growth in developed economies. Peter’s point about the economic value and financial viability of the next road is entirely supported by these cases. So you’re arguing that if the traffic forecasts had been correct, the roads never would have been built? Excellent point – I totally agree! But the traffic forecasts were wrong. An example of just how wrong is shown by the forecast and actual chart of Sydney’s tolled Lane Cove Tunnel in this article. Part of my point is that, just as you, as an economist, are now trying to definitively clam that “the fact that the average road pays for itself does not mean that the next road will also pay for itself“, professional transport economists a decade ago were definitively claiming the opposite ! Of course, you can rightly claim they were proven wrong (although probably more due to reasons that “forecasters come up with traffic figures based on their business needs, not what happens on the road“). My view is the evidence of the Australian toll road failures says more about the certainty we should place on economists predicting the future than the merits of the prediction itself. So we need imaginary traffic to make these roads profitable? Is that your point? Well, they were wrong, weren’t they. I think you misunderstand the point I am making. Rather than making a projection based on un-tested assumptions about human behaviour, I have gone out and observed the decisions that people have _actually_ made after new roads have been built. That’s the same approach that Bent Flyvbjerg uses in the paper that you cited earlier – look at actual behaviour rather than models. Tony, might pay to point out that the initial modeling actually turned out to be true. The unfortunate problem is they didn’t want to hear that their mega project would be an abject failure and shouldn’t be built, so they ignored that and redid the modeling to lie to the the PPP investors and get funding for it anyway. Sorry, I thought that was exactly what I was pointing out. These toll roads were never going to work and should not have been built. I do not dispute Peter’s primary point that it is difficult to get motorists to cover the whole cost of a new road through a toll. I just think his example of the Australia Toll Roads is the wrong use of evidence on this point. As you have already noted, the initial forecasts showed these roading proposals were overly optimistic but transport economists fixed the predicted patronage so the capital investment numbers made sense. What the Australian Toll Roads shows is the extent to which transport consulting firms will massage the figures to get their forecasts to support the “right” outcome for whoever is paying them when large sums of money are involved. Of course toll road projects are not the only projects open to optimism bias, major PT projects that require large capital investments have also had published forecasts that were far too optimistic and they will in the future too . . .
Well no Tony, your point was that transport economists can never be trusted because one group of them got something (intentionally) wrong once. I’m just pointing out that the ones with scruples actually got it very right, so at least some of them can be trusted some of the time. No Tony we can’t let that broad smear stand. Well not in Auckland and not this century. Quite the reverse is the case, the models in use by MoT. NZTA, and AT, have all significantly under-predicted ridership of major public transport investments while over-predicting car use. Most notably the Northern Busway and Britomart, which reached it’s 2021 passenger predictions in 2011. We have had a look at the assumptions buried in the models and it is easy to see why, they have been written with curious biases; for instance it is assumed that every driver parks exactly at their destination [ie there is no walk time from park to destination- we are all executives with reserved parking next to our desks], it is assumed for Transit that transfers between modes and vehicles are extremely onerous and are accorded huge time and cost penalties and so on, which is simply not always the case [although can be of course] and particularly as AT is building an integrated network that facilitates transfers. And so on. So in fact in Auckland and probably NZ there is a clear ‘optimism bias’ for traffic and ‘pessimism bias’ for PT, which of course reflects dominant views of government and our major transport institutions, including Treasury. Or, perhaps to be charitable, simply reflects the conditions that existed last century so these institutions seem to be rather slow in catching up with a changed reality. As this is more than a decade ago perhaps that wasn’t so charitable after all? Or perhaps you have some examples of over-predicted ridership of relevant ‘major PT projects’? SO many people think everything should be privatised believe the ancient and long since disproved myth that the market is rational and perfect and should never be tampered with. the silliness of this belief in the face of facts is borne out every day in failed business ventures, stock market crashes, failed banks [if allowed to], etc etc. getting financing for something doesn’t mean it’s a good risk or good idea. financiers are as subject to fads as anyone. that’s how markets get overbuilt. as for toll roads, if the developer and his bank want the project they can easily fudge the numbers to make it look like a winner when better projections don’t tell them what they want to hear. I was driving to Brisbane airport recently and avoiding tolls is difficult to do as signage and lane markings encourage drivers into the tunnels and onto bridges, even in the light traffic conditions we experienced where there’d be very little benefit to doing so. Its telling that drivers avoid them even in congested conditions. “all these toll roads were predicted to pay for themselves” which may or may not be a logical fallacy in your view but it is certainly a factual delusion. The decision to invest private finance and go ahead with construction is based upon these very predictions. There are now numerous historic examples which demonstrate clearly that the predictions were invariably wrong. We can reasonably conclude from the available evidence that the people making such predictions are incompetent or in denial. That’s the same problem with the idea that “road pricing will solve congestion”. It does, but at the cost of making people worse off. Now loads of people have to pay for a service (slightly-less-congested driving) that many don’t actually think is worth the cost. Dead right Frank. The “cost of congestion” is almost always vastly overstated. toll roads work best in a monopoly situation, i.e., when there is little or no practical alternative to the toll road. toll roads also work better for long distance travel. the Indiana toll road is a good example. if you want cross Indiana, say from Chicago to Cleveland, you wouldn’t take any other route unless you really have nowhere to go and all day to get there. [and no one goes *to* Indiana because why would anyone want to?] [the road it replaced decades ago, US Rt. 20, is an interesting drive to see virtual ghost towns and flashing red lights at what used to be major intersections.] this goes double for trucks. drivers are on strict pick up/delivery time agreements and have to maintain top speeds. [very little talk of truck tfc and toll roads here.] trucks also pay substantially higher tolls. and, of course, many bridges are suitable for tolling. however, privately controlled monopolies are generally considered to be a bad idea, especially with something with a primarily public purpose. that’s why government pays for transport infrastructure. they pass on costs wherever they can [landing fees], but are also able to subsidise as needed in the pursuit of a public good. private firms don’t do that, and with an investment with a 50 or 100 year life, no financial market is equipped to accept terms based on a 50 year payback without charging a very high interest rate. the private sector should not be in the business of providing public goods, nor should they establish monopolies. those are classic roles of government. the record is littered with cases of failed privatsations. they don’t make economic sense and often require subsidies anyway. they are a political tool. i had one more point to make but lost it. and it was such a good one. You make a good point about the differences between public goods and private goods. And you’re right that there can be significant downsides to private provision of infrastructure. However, I do think that government infrastructure providers could benefit from knowledge transfer from the private sector. It’s incredibly important to be able to identify and read “market signals” when choosing what to build next. I beg to differ. I have travelled from Cleveland to Chicago and back on a number of occasions on Amtrak, much of it asleep…not something that I wanted to do when behind the wheel of my trusty Subaru! i appreciate your choice of nap modes, having been a regular Indiana toll road traveler. Subarus are rugged but not that rugged. i was speaking in the context of the article which was on toll roads. the train is an altogether different matter, and it would be a great choice, sleepy or otherwise, with shorter headways and a bit more speed. still, it’s a nice train ride especially if you want to go downtown to downtown. I’m an unrepentant rail enthusiast but a trip on a Superliner-equipped Amtrak train is hard to beat. We even managed to do a couple of Autotrain trips from Virginia to Florida when we lived in VA. One of these days I must go back to the US and do some serious Amtrakking. As for Subarus; my old Legacy got places in the wilds of Kentucky, Virginia and Pennsylvania that a bog-ordinary Subaru really should’t go. Sometimes we will choose to pay sometimes we will not. The USA has a mix of free and toll roads.